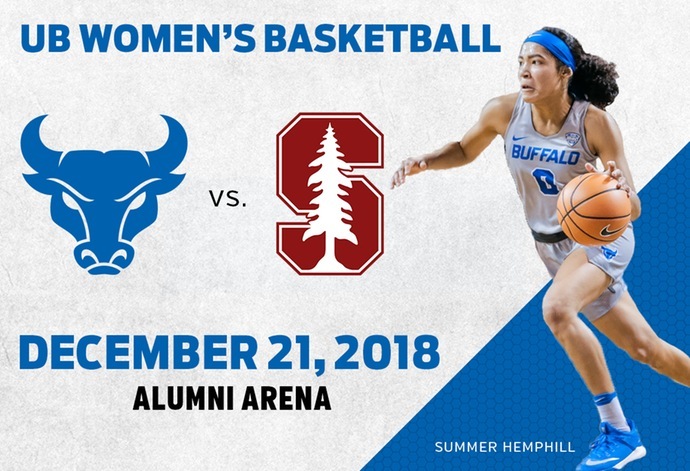 BUFFALO, N.Y. -- Coming off of their historic 2017-18 campaign, the University at Buffalo women's basketball team will entertain national powerhouse Stanford inside Alumni Arena on Friday, December 21 in a non-conference clash of Sweet 16 teams from a season ago. This matchup marks the first meeting between the two teams in school history. "In order to be the best you have to play the best and that is why we put Stanford on our schedule," said head coach Felisha Legette-Jack. "This is going to be an unbelievable experience for our team having one of the most respected programs in the country come to our gym. 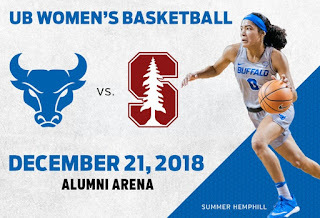 I have a great amount of respect for Tara VanDerveer and what she has done at Stanford and I hope the Buffalo Nation will come out and support us as we take on the Cardinals on December 21." The Bulls Cinderella run to the Sweet 16 forced them to rise 14 places in the final USA Today Coaches Top 25 poll as they finished #21 in the nation, the first national ranking in program history. The Cardinals were also able to close out the 2017-18 season inside the top 25, coming in at #13 in the nation following a pair of NCAA Tournament victories and Sweet 16 appearance. Cardinals head coach Tara VanDerveer will be making her homecoming appearance in Western New York on December 21 as she returns to coach in Buffalo for the first time since being inducted into the Greater Buffalo Sports Hall of Fame in 1999. VanDerveer grew up in WNY and had a very successful coaching career at Sacred Heart Academy before earning her first shot at the division I level becoming head coach at Idaho in 1978. The iconic VanDerveer has posted a career record of 1,036-242 (.811) while being inducted into the Naismith Basketball Hall of Fame (2011) and the Women's Basketball Hall of Fame (2002). She is also a four-time National Coach of the Year award winner and 15-time Pac-12 Coach of the Year award recipient. Stanford compiled a 24-11 overall record and a 14-3 mark in Pac-12 play last season, earning the #4 seed in the NCAA Tournament and advancing to their 11th straight Sweet 16 before falling to #1 Louisville in the Lexington Regional. The Cardinals will return three starters and 12 letterwinners from a season ago as Alanna Smith returns for her senior campaign after averaging 13.5 points, 7.0 rebounds and 1.8 blocks while shooting 47.4% from the floor and averaging 2.6 offensive rebounds/game. Sophomore Kiana Williams will also be looking to build off of her great freshman season that saw her post averages of 10.4 points and 1.9 assists while connecting on a team-best 71 three pointers. Stanford also has a decorated recruiting class coming into the 2018-19 campaign, ranking 10th nationally. The Cardinals top recruit, Jenna Brown, is a five-star talent who was rated as the 18th best player in the country and the #2 point guard according to espnW while also earning a spot on the USA Basketball U18 National team that will compete in the 2018 FIBA Americas U18 Championships in August. Buffalo has not played host to a nationally ranked opponent at Alumni Arena since February 25, 2009 when #25 Bowling Green came to town and downed the Bulls 89-82 in overtime. The Stanford announcement comes on the heels of the Bulls announcing a trip out to Las Vegas for the South Point Thanksgiving Shootout, a tournament that features two Sweet 16 programs from a season ago in Louisville and Baylor. The rest of the Bulls non-conference schedule will be announced in the coming weeks and can be found on ubbulls.com. Don't miss out on any of the action for the UB women's basketball team this season as we are currently accepting deposits for new season ticket holders. All you have to do is stop by or call the Alumni Arena box office at 1-877-UB-THERE.